Sloane Square borders some of the most luxurious and exclusive areas in London, namely Knightsbridge, Belgravia and Chelsea, and is surrounded by wonderfully large town houses in the mixed style of Gothic, Classical and Edwardian. It is an exclusive area and was given its name after Sir Hans Sloane who owned the land at the time. The Botanist occupies a prominent corner of the square and was so named after the aforementioned Sir Hans, who was a famous botanist and collector whose other claim to fame, after naming the square, was that he bequeathed his collection to the nation which formed the beginning of the British Museum. The Botanist is an iconic bar and restaurant where people can drop in for a drink after a hard day’s shopping along the King’s Road and watch the London elite sipping Champagne or the signature botanical cocktails, or dine in the restaurant which serves a mix of modern European food. We visited the Botanist on a Sunday lunchtime to enjoy a relaxed Sunday Brunch, and even then the bar and the restaurant had a lively buzz, but we resisted the lure of the art deco bar and immediately went into the restaurant. The restaurant is split from the bar and is airier due to the large floor to ceiling windows providing lots of light, but the décor in both is an eclectic mix of colours and designs. Rousseauesk painting of animals in vivid colours rub shoulders with light mauve leather chairs, wooden tables and red and blue leather chairs in the bar. This explosion of colours really shouldn’t work, but in a crazy way it does, and this crazy mix of things flows into the menu choices and dishes. The Brunch Menu is available from 9am to 4pm at weekends and the menu is split into 4 sections, Lighter Options, Starters, Salads and Mains. The lighter options section focus’ more on breakfast dishes but with a twist, so porridge is twinned with coconut milk and passion fruit (£7.5) and sweetcorn and chilli fritters are served with grilled tomatoes, watercress and mint yoghurt (£9). Our brunch started with the starter section where I selected the Tuna Tartare, Avocado, Radish, Macadamia and Prawn Crackers (£11.5), and my wife selected Burrata, Isle of White Tomatoes, Avocado and Chilli (£13). The Burrata was light and creamy and the chilli gave just enough heat to the fresh English ingredients. My tuna was a generous size and was good, but unfortunately the wonderful fresh, meaty tuna was swamped by the overpowering taste of sesame oil. There was a lovely oriental flavour, but unfortunately at the expense of the main ingredient. The salad options are perfect for those health-conscious people with Superfood Quinoa (£15), along with that classic Caesar Salad (£12), but we resisted the healthy options and selected from the Mains section. My wife opted for the Scottish Salmon Fishcake, Poached Egg, Spinach and Parsley Sauce (£16) with a side of Mash Potato (£4.5), whereas I opted for the Longhorn Beef Burger, cheese, caramelised onions and fries served on a choice of buns (£17.5). The Botanist sources its ingredients from English sources and many are selected from small family owned business’ as the thought process is that these business’ care more about their products, and this is borne out by the taste. The fishcake was perched expectantly on a bed of wilted spinach smothered in a light and creamy parsley sauce which was nicely soaked up by the smooth mash, and my burger was a first for our meal, as instead of mixing lots of ingredients and tastes, this dish rested on the quality of the double beef patties which was sensible, as they happily stood up to the test. The portions are so generous we were too full to partake of a dessert, well it was brunch! But the selection has many English classics and a imaginative selection of cheeses which sorely tempted me. Prices are reasonable for this part of the city, and that is emphasised by the wine selection where we chose a crisp and fresh house white for under £25, which would give many grander labels a run for their money. The Botanist is a perfect place to enjoy a drink or a meal at any time of the day or night and offers quality in a lovely relaxed atmosphere. I have worked at Canary Wharf on and off for over 25 years, from when it didn’t have the Jubilee Line, and at weekends the only way in or out was by bus that took an hour to get from Canary Wharf to Bank. Now it has grown three fold, and is about to welcome Cross Rail, but what hasn’t changed in all that time is its style. Canary Wharf is a place with grandiose buildings with vast atriums, high ceilings, an abundance of marble and unfeasibly large doors that are almost impossible to push open! 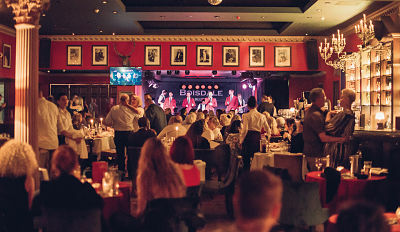 Although Boisdale is located in Canary Wharf, its charm is how different it is, as it has the feel of a Mayfair men’s club in the heart of Canary Wharf and is certainly unique to all the bars and restaurants here. 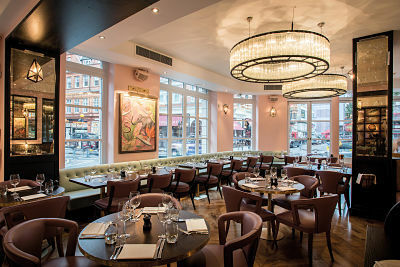 Boisdale is situated on two floors overlooking Cabot Square, and regardless of whether you are on the first floor on the terrace surrounding the oyster bar or in the restaurant on the second, the view out over Cabot Square fountains is a wonderful backdrop. The oyster bar is an art deco connoisseur’s dream, and has arched bar mirrors the shape of the window leading to the terrace where those looking for an after work drink or an informal bite to eat can sip a drink and watch people making their weary way home. If you take the elevator to the second floor rather than the first you come out into one the more majestic restaurants you will find. Canary Wharf restaurants are all glass and white walls whereas here the walls are Boisdale’s distinctive lacquer red and dark green with rich mahogany panelling, more at home in St James’ rather than the modern Canary Wharf, but Boisdale dares to be different and stands out because of it. The feeling is warm and classy and the colourful walls are adorned with pictures of stars who have played the venue along with a few artistic nudes! Your route to your table is flanked on one side by an awe inspiring 12 metre long glowing amber whisky bar. The bar holds approximately 1,000 different bottles of malt whisky and I think can rightly claim to have one of the most extensive and magnificent whisky selections in the world. The Boisdale is not just a restaurant and bar, it is a music venue as well, and regularly has jazz, blues and soul music sourced by its patron of music, Jules Holland. It also has bands/singers and that list of performers is impressive. We visited when Alexander O’Neal was playing and took advantage of their Dinner and Show Club, and other famous artists in recent months include Melanie C (the one Spice girl who could sing), Rita Coolidge and Marcella Detroit (from Shakespears Sister). Our evening started with dinner followed by a performance from one of THE soul singers of the 80’s. For starters I selected the Mini Roast Dumfriesshire Blackface Haggis with mashed potatoes and bashed neeps, and my wife the Crispy Szechaun Pepper & Chilli Squid with lime and chilli mayonnaise. Haggis is not everyone’s cup of tea, indeed it is not my favourite, but as Boisdale has Scottish roots and I was promised it was something special I plumped for it and was glad I did. The tastes were rich and rewarding and the special secret ingredients and spices resulted in a very special sauce, and earthy neeps and creamy potatoes were perfect accompaniments. The Szechuan and Chilli Squid was light and crispy and packed a fair punch, and the lime in the creamy mayonnaise added a slight hint of sharpness which married with the heat nicely. Portion sizes are generous and none more so with our selections for mains. My wife opted for the Truffle Aberdeenshire Rib-Steak Hamburger with black truffle mayonnaise, gruyere de comte cheese, roast mushrooms and thrice cooked chips, and I the 12oz Dry Aged Aberdeenshire Ribeye Steak with thrice cooked chips. The burger was a gooey delight as the juices from the meat soaked into the bread, and my steak melted in my mouth and had that lovely chargrilled flavour with a slightly crispy outer skin. The chips were gorgeous and the light fluffy potato encased in a crispy skin was perfect. As said the portions are generous, so we paused for a while before tackling dessert and enjoyed the happy buzz generated by contented diners whilst sipping on a crisp and light house Sauvignon Blanc. When we were ready my wife was served the Apple Tarte Fine with Burbon Vanilla Ice Cream and I went with the Dark Chocolate & Caramel Marquise with Honeycomb. The tartness of the apple and the sweetness of the pastry were perfect partners and that contrast was also exhibited with the sweet caramel and the bitter dark chocolate in the marquise. The marquise was indulgently smooth, and although I had eaten well, it was just so good I felt I could have eaten another slice! Alexander O’Neal, featured on our cover, played a great set, and as we left we remarked that Boisdale has something for everyone and is a perfect way to spend an evening, as where else can you get such a perfect combination of drink, food and music, all set in an eclectic mix of styles and colours which combine to provide a unique venue. But don’t take my word for it, try it for yourself. 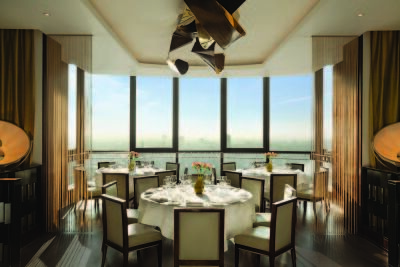 The stunning Michelin-starred restaurant Galvin at Windows, is located on the 28th Floor of London Hilton on Park Lane and was launched in May 2006. It is superbly situated in the heart of Mayfair. With an interior evoking the glamour of the 1930s, we were intrigued to find out why this bar and restaurant has become one of the most talked about destinations since opening, and has maintained its Michelin- starred status each year since 2009. On arrival we were taken to the Galvin at Windows bar where they offer a wide range of cocktails, from the classic martini and negroni to the specially created ‘signature cocktails’ that showcase the knowledge and expertise of the team. We were able to relax with a glass of Galvin champagne, whilst we marvelled over the 360 degree stunning views over the capital, including some of the most iconic sites: from the sky scrapers of the City and Canary Wharf, to the London Eye, Hyde Park, Buckingham Palace and Wembley Stadium. This bar and restaurant certainly boasts some of the most spectacular views of London. Chef Patron Chris Galvin and his team create seasonally inspired menus based around modern French haute cuisine. All of which make this a sought-after dining experience and a definite place to go if you are looking to impress, celebrate a special occasion or just have a great time with friends, colleagues or family. The kitchen is led by Head Chef Joo Won, who has been at the restaurant since 2006 and has worked his way up the ranks from Chef de Partie to Head Chef. We enjoyed the Menu Prestige, priced at £82 for three sumptuous courses. But, there are a range of other menus available including a 7-course tasting menu at £119 per head, and some fabulous ‘affordable’ offers on the website. The seasonally inspired Menu Prestige offers a good variety of dishes, and gives you the option of starting the meal with a choice of caviar (at an additional cost). Starters include Ballotine of Foie Gras with spice salt, orange, pistachio, & honey millefeuille, Marinated Iberico Pork with mooli and pickled mushroom, and Salad of Asparagus, Turnips, Lemon Grass & Romseco. I opted for the Cured Loch Fyne Salmon, brown crab mousseline & celeriac remoulade. My wife chose the Velouté of Mushrooms, hen egg, confit duck legs & wild garlic pesto. Both of these dishes were beautifully presented and memorable for their flavours, quality and texture. The main course selection held great appeal to me, including such offerings as Lobster Risotto & tarragon oil, Fillet of Scotch Beef, braised shallot, short rib beignet, ox tongue & red wine jus (both dishes supplement £6), or the Pan-Fried Red Mullet with shellfish ravioli, aioli & spinach. I selected the Rump of Lamb, glazed breast, Bolognese, goat cheese & jus gras. The lamb was perfectly lean, with a deliciously rich jus. I enjoyed the pairing of goats cheese and Bolognese too, giving an exciting twist to the dish. The friendly Sommelier had recommended matching this with a glass of Chianti, which provided the perfect accompaniment. My wife ordered the Fillet of Stone Bass, caponata, olive, crispy baby squid & courgette. This dish did not disappoint - the delicate flavour of the fish still discernible amongst the olive, caponata and baby squid. Ahead of dessert we enjoyed a selection of seasonal cheeses by Maître affineur ‘Buchanans’. This is available as an additional course for £18 or as a dessert choice for a £12 supplement. The selection of desserts is one of the best I have seen in a long time, with recommended wines to complement each choice. I was won over by the Valrhona Chocolate “Cigar ”, Tonka, Coffee, Bourbon Sponge & Hazelnut Ice Cream (with a delicious glass of Madeira), whilst my wife opted for the Pear Soufflé with warm Salt Caramel Fudge and Cinnamon Ice Cream. This she declared to be heaven on a plate, and I have to say I was blown away by the delicacy of the texture. The whole experience was enhanced by the easy-going, friendly attention of our Sommelier. She did a fantastic job of pairing each course perfectly with wines from a wide- ranging list. The Cognac trolley is, in itself, a sight to behold, made up of some of the most beautifully ornate bottles I have seen. A the end of the meal, with the gentlest of persuasion, she suggested that a digestif was a perfect idea. She was right, of course! The highly attentive, yet unobtrusive service, coupled with some of the most jaw-dropping views of London, makes this restaurant a real destination, but your reason for visiting Galvin at Windows should first and foremost be for the food. With menus to suit a wide range of occasions and budgets - including a dedicated Kids Menu and Sunday Lunch Menu, Michelin-star cuisine is more accessible than you might think.